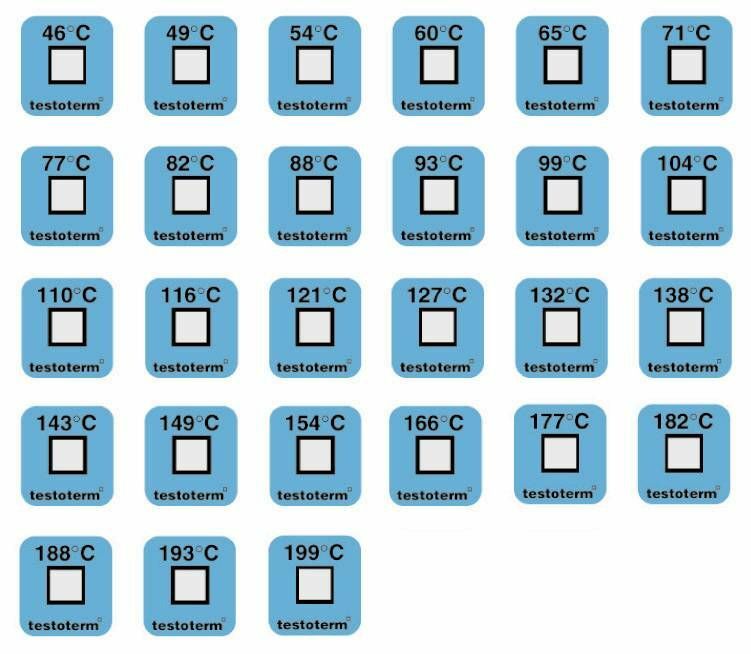 testoterm measuring points are self-adhesive, temperature-sensitive films that respond by changing colour when a certain temperature is exceeded. They are ideal for monitoring the temperature of products and processes where a specific temperature must not be exceeded. The measuring points are supplied in a book of 50. Just like stickers, they can be easily removed from the book and affixed on the measurement object. As soon as the specific temperature point (+110 °C) is exceeded, the measuring point changes colour within 2 to 3 seconds. The colour change is permanent: once the temperature has been exceeded, the measuring point will not change back to neutral even if the temperature drops again. This means that a critical temperature increase can be identified even after an extended period. testoterm measuring points for the temperature point +110 °C, available in books of 50.